Thought I would smoke some spice this morning and create something using sacred geometry. Starting with the fruit of life, I incorporated the tetrahedron and the cube(if you can find them). Sorry about pic quality. DP you got me thinking and now I can't get it outta my head. Look around.. everything involves sacred geometry. Anyway here is the pic. I started this thread hoping to find someone who could give me more understanding. I never, ever, expected this kind of response. But then again, our hobby and the point of it, is really the same point of sacred geometry. To ascend higher and higher, to experience higher and higher states of existence, creation and knowledge. Give me a bit and ill try my best to answer all these questions, just let me grab something to eat first. Ill teach you guys everything I know/understand. As there is one rule in the cosmos about knowledge, once you understand/realize/are given knowledge, it is your duty to share it and pass it on. Without this one rule of knowledge etiquette, we would not be where we are as a species. Knowledge is a birthright, once its received, it must be given. Its an honor to be able to serve. I once memorized the fibonacci sequence to a billion. I thought it would open up for me some understanding about the way energy moves and the way life and matter is built. One can count in this sequence instead of numerical order, but it still hasn't revealed to me the simplistic genius of meaning I was hoping to find in nature's language. So far what I had hoped to find has eluded me. It seems to play a major role and returns to prominence over and over again in my research. I'd like to one day understand it well. Thank you for this post, it is a wonderful topic. The patterns mentioned are all real in nature, this we can agree on. Geometric patterns are the building blocks upon which minerals form; the atoms themselves taking on geometric patterns in definable and infinitely repeatable forms. Basically, I wanted to try and catch your interest in the name of mineralogy, for I believe some of the more definitive answers available to us humans can be found in the geological and chemical world. Drawing and understanding patterns is endless fun, I think its also kinda fun to apply these patterns to the material world around us. Ok so you study it and then what? What's the point? I've been interested in it and I know that sacred geometry is everywhere but what's next?? So there are 13 different informational systems inside sacred geometry. 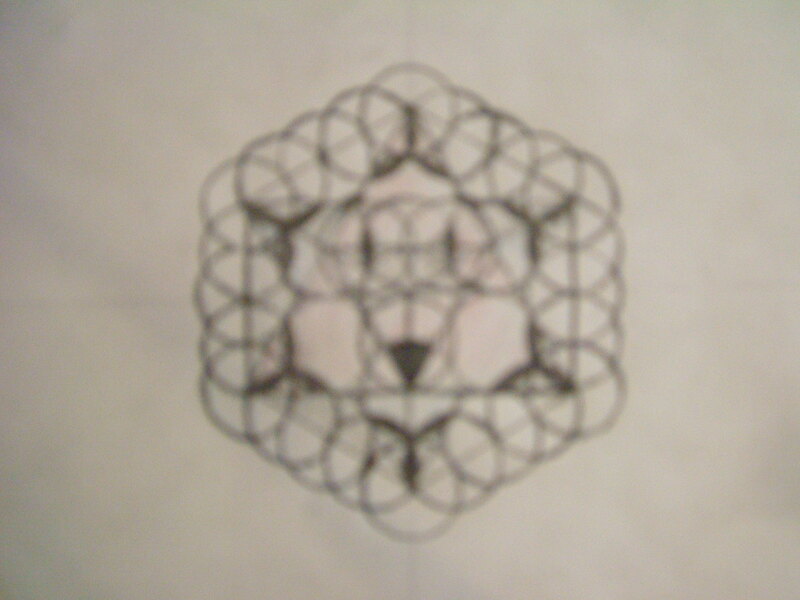 We are talking about one here, the Metatron's cube. It is said that you can spend half of your mature life studying one information system, and still not even know everything. So lets think about this here, sacred geometry is the underlying map and basis for everything, think about all of that information. It is impossible for a human in our state of evolution to come even close to master 2 of these systems in one life. The knowledge is limitless. But to answer you question, the platonic solids are the building blocks of the underlying structure. Look at how crystalline structures for every element form, they will all follow platonic solids. How the first eights cells of life begins, and I believe all life if I'm not mistaken. Metallurgy, dna structure, it all comes down from these platonic solids. Like wearegomba said, look at mineral, atomic structure, and these platonic solids will be important. Here is an example with dna: "When you rotate a cube through 72 degrees in a particular patter, it makes an icosahedron, which in turn a dual with the dodecahedron. So there's a reciprocal pattern going up the dna strands; the icosahedron, then the dodecahedron, then icosahedron, continue back and forth, This rotation through the cube crates the dna molecule"
In sacred geometry the tetrahedron is fire, the hexahedron is earth, the octahedron air, the icosahedron is water, the dodecahedron is prana and the sphere is the void. When studying alchemy they seldom talk about prana because it is scared, you only hear, earth, wind, fire and water. It is said that in the Pythagorean school, if you said the word "dodecahedron" out side of school, they would kill you. That's how sacred this was. I also see allot of talk here about the golden ratio (phi = 1.6180339...) and the Fibonacci sequence (1,1,2,3,5,8,13...). It is very important to know that one can happen in existence and one can not. I feel very strongly that there exists NO golden mean rectangles or spirals in existence unless they were made synthetically. Nature does not use this pattern and it literally does not no how to because it will go on forever. Going out forever is easier to get past in existence, never having a beginning is a different story. There is no beginning to a golden mean spiral, this is impossible to create in this realm imo. What is existence answer to this problem? The Fibonacci sequence, Life came up with another way, life will always find a way. Its way was to copy the golden ration but in the only way it could. Look what happens when you divide each number of the Fibonacci sequence into the next higher number. By steps 55 and 89, the two are practically identical (to golden mean - 1.6180339...). They eye could not tell the difference at this point. This is very important! 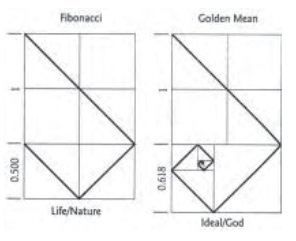 The difference between the golden mean/ratio and Fibonacci must be realized to move on, the Fibonacci has a defined beginning, the golden mean/ratio does not. Edited by dpwishy, 11 November 2010 - 07:58 PM. "Figure 8-10 shows the difference between the two. The golden mean spiral is the ideal. It is like God, the Source. As you can see, the top four squares on both drawings are the same size. The difference is in the areas where they originate (the bottom sections of the two diagrams). The bottom of the Fibonacci spiral has an area half the size (.5) of the area above; the golden mean spiral has an area 0.618 the size of the area above. The Fibonacci spiral shown at near right is constructed using six equal squares, where the golden mean spiral starts deeper inside ( actually it never starts, it has been going on forever like God). Even though the originating point is different, they very quickly approximate each other." One thing that has fascinated me is how I've seen all sorts of diagrams illustrating beautiful patterns from the julia set, mandlebrot set, golden ratio, tree of life, etc etc. In each and every case, the pictures created by man are 'perfect', while examples of them in nature almost always have flaws or an area of randomness. Even within my own visions, the patterns are never 'perfect' in a man made sense(although this serves to make them more beautiful in my mind). You sit in the PNW, in the middle of the forest and you see mandlebrot, julia, fibonacci everywhere, but for some reason they are so much more interesting than the ones we create on paper or through computers. I wonder why that is? I recently saw a show on fractals. Did you know you could measure the angles and lengths on a single tree in a forest, and from that data you could calculate the total oxygen consumption of the entire forest? That's because of the fractal nature of things. The entire forest will, on average, be similar to that one tree you measured. From the tiniest shrub to the largest tree. That boggles my mind, hehe. The Repetition of forms and Symmetry is the other most amazing aspect of nature/reality. Has anyone come across any good books on the Subject of Sacred Geometry? I have mostly found links to some sites but not much in the way of literature as of yet. Reminds me of the theory of relativity being considered slightly less predictable mathematics than quantum mechanics when applied to this reality. Makes small matter more and large objects interacting observably different and harder to describe due to the ascending movement of creation versus the descending spiral forever that likely doesn't exist. I get your point, and im happy for our differences and appreciate our uniqueness deeply. It should be noted however, that if one can grasp the proportions represented by Fibonacci and superimpose that knowledge with regular old numerical order, plus recent brilliant realizations about the void being full of energy and emptiness represented by zero, one begins to see reality in a more graphic perspective. Our perspective is often so limited, its refreshing to find out there is much more behind the scenes that our limited senses dont generally recognize. I'd love to see some cutting edge new fractyl computer generator stuff suddenly open up this realm of understanding more thoroughly. Thanks DP for shedding some light on the subject! BTW, has anyone seen those crystaline structures that were studied by a Japanese Dr who wrote words on their containers like love or beauty or ugly words and actually thought about whatever was written on it and then under magnification, it was shown that thoughts can influence crystaline formation (paraphrasing of course, but I'll look for that article- twas fascinating). -sorta like creation in action. Edited by riseabovethought, 12 November 2010 - 02:15 PM. Yeah, I got those PDFs thanks to Nuggs. Or at least the links to them. For some reason I can't get any downloads to work w/ Linux. It never gets anywhere. My computer is all buggy and few things seem to work right. I have the PDFs downloading but I never get any peers. It used to work but stopped one day. I was just looking through what else came up online and most were sites etc. That and was looking at what Amazon had and was wondering if anyone had read anything worthwhile. Edited by Shadowlord, 12 November 2010 - 12:12 PM. this topic is most fascinating. i just have to relax my eyes and its there. mostly because it explains and makes possible everything. 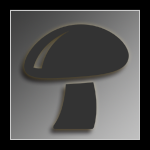 well rounded energy source for the "god head". we are frequencies being picked up by the earth antenna. the sacred geometry patterns are the frequencies visualized. the 13th is the doorway. that is why 13 is such an important number in mason/illuminati lore. and waking ourselves to sleep. I'd like to read that article if you find it R.A.T. Sounds like Herbert's Weirding from Dune. Words and thoughts have a sound and power. Thought as project-able energy wavelengths. No wonder positive or negative thoughts/mindframe influences us and our actions and is so pervasive yet overlooked. there is a mass experiment happening now and a few more times based on mass meditation and reforming the earth via love. journey began, so it seemed right! And I got the PDFs to dowload finally, so hooray there as well! Sacred geometry is fascinating, i've seen some with eyes closed on mushrooms, and spice takes me there at another level. I think it is very sacred, perhaps the building blocks of life. It could connect all things and dimensions, when we figure it out better the knowledge may open up travel to space and time. Dr. Emoto has amazing pictures of water having been influenced by his team, just before freezing, crystallizing into distinct patterns depending on what word is written on its container. Much more could be dug up on his work, which is pretty cool IMHO. Edited by riseabovethought, 12 November 2010 - 02:04 PM.